The Flux Onslaught V2 provides sensational levels of performance and it’s definitely not for the faint hearted! That mega-powerful brushless motor with hi-performance ESC provide all the torque and low speed muscle you need to conquer even the most demanding trails! Then when the terrain levels, use the massive power to propel this awesome looking truck to speeds you wouldn’t have imagined possible! Featuring a top-of-line specification, the Flux Onslaught V2 includes twin differentials, oil-filled adjustable shocks and fully adjustable suspension, enabling you to tune the handling characteristics to perfectly suit your driving style. Then to keep you in complete control we include an interference-free 2.4GHz steer-wheel radio system! Supplied with a 7.4v 3200mAh Li-Po battery pack, just add a suitable charger to complete and you’re ready for action! High performance 1/10th off-road trucking has never been so easy, so much fun, or so affordable! 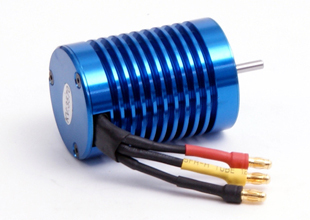 The Flux Onslaught V2 features a powerful brushless motor system with CNC casing and built in cooling fins. The Flux Onslaught V2 features twin sealed differential units, with steel, beveled drive gears to ensure maximum strength and efficient drive transfer to the place you need it most, the wheel in each corner.